The Los Angeles Jr. Kings get it. While grooming young men and women to become better hockey players is obviously their core competency, those within the club know full well the odds of reaching the NHL – or making a living playing at any level long term – are slim. L.A. also firmly believes that excelling academically is equally important – given there’s a far greater chance a sound education will translate into more opportunities as their players thrust into adulthood – and there’s no better poster boy who’s embraced that mature line of thinking than Jr. Kings lifer Tomas Sholl. 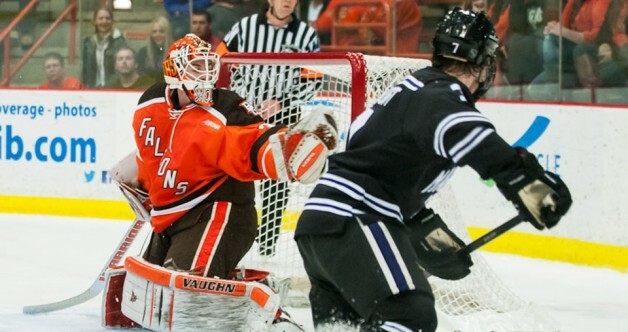 A junior goaltender at Bowling Green State University, Sholl was recently named to the WCHA All-Academic Team for his efforts in the classroom this year. It marks the second time Sholl, who was rooted in the Jr. Kings program from Mites through his Midget 16U AAA years, has been recognized with the honor as a member of the Ohio-based school. “It’s a great feeling, because at the end of the day that’s the reason I wanted to play college hockey over less-academically-focused alternatives,” said Sholl, who holds a 3.96 GPA while working towards his degree in business administration with specializations in finance and applied economics. Being a part of the Jr. Kings family also yielded plenty of benefits for the Hermosa Beach native. Sholl’s value to the Falcons program certainly isn’t lost on Bowling Green head coach Chris Bergeron. While balancing the rigors of a full academic workload coupled with the demands that come with being an NCAA Division I athlete has its challenges, Sholl wouldn’t trade the experience for the world. And in the end, growing and evolving as a person, as well as a player, is what the game is all about, according to Sholl. “Hockey is the greatest game in the world, so no matter what level you play it should be fun,” said Sholl, who’s leaning towards a career in finance upon graduation next year if a professional playing opportunity doesn’t present itself. “The lessons you learn playing the game are priceless and make you a better person.